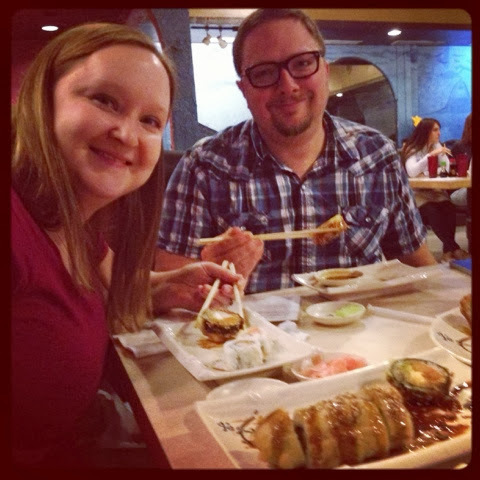 Daniel and Ashley Adopt: Sushi!! On Saturday we went to an adoption conference and learned so much. It was really good for us. We listened to a birth mother panel, talked with others about feelings associated with infertility and the adoption world in general. We're both glad we attended. Afterwards we went and got sushi with my sister and her husband. I'm such good friends with my sister and we enjoy spending time together. The four of us have good times! They both tried nagiri (raw fish on rice bundles) for the first time. Let's just say we like it more than they do! I'm so glad we had such a good day and got to enjoy spending time with them. I'm grateful for them and our friendship. A favorites was the deep fried roll with crab and cream cheese. Yumm-mmy. Do you like foreign foods? What's your favorite?